Normanton is a town and civil parish within the City of Wakefield in West Yorkshire, England. 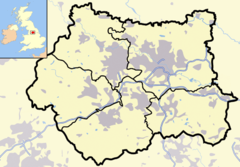 It is northeast of Wakefield and southwest of Castleford, and at the time of the 2001 Census, the population was 19,949. Normanton was originally surrounded by a moat, and in Norman times was the site of an enclosed settlement (chosen for its strategic view points across the surrounding area), and became known as 'Norman - tune', or 'Norman - ton'. At the time the Domesday Book was compiled in 1086, the colonization of Yorkshire by the Normans was well underway. Archaeological evidence at today's Normanton points to Haw Hill (or How Hill), an eminence that was probably a Norman defensive strategic mound once reinforced by a wooden palisade. The evidence of a Norman motte-and-bailey fortification at the town, and the name, is likely evidence that Normanton's name derived from the substantial Anglo-Norman presence in the area. Nearby, after all, were Tickhill, the fortress of Norman magnate Roger de Busli, as well as other new Norman power centers. Although the area had once been part of the Scandinavian Danelaw, William the Conqueror's scorched earth northern campaign had left the area ripe for exploitation by his Lords. By all measures, Normanton likely owes its name to these new aggressive warriors. One of the earliest buildings to survive within the village is Hanson House. This is set back from the church and has a timber frame construction. The building was constructed in the mid 15th century, with a later wing added in the 18th century. A fire has unfortunately damaged the building, which is being restored and modernised. A grammar school was founded in Normanton by John Freeston (now the 'Parish Rooms'..later moved to the site of the, Normanton Junior School on Church lane) in 1592, but the town remained very small until it became the focus of several railway lines in the mid-19th century. Work began in 1837 under the supervision of George Stephenson on the construction of the North Midland Railway from Derby to Leeds. This was soon followed by an addition to the York and North Midland Railway from York and then the Manchester and Leeds Railway from Manchester which all extended to Normanton thereby giving the town access to much of the country. The Leeds and Manchester lines crossed a 51-mile (82 km) stretch across The Pennines and at the time boasted the world's longest railway station platform at Normanton - a quarter of a mile long. The station was, for the next ten years or so, the most important in England, employing over 700 people who looked after the station's 700,000 passengers a year. In Victorian times Normanton station was one of the most important stations in northern England and can boast that Queen Victoria stopped over in The Station Hotel. The town also served as an important part of the transport infrastructure for national and local industries including coal and bricks, although most of this was lost during the 1950s and 1960s with the last remaining operational brickworks eventually closing in the mid-nineties. There were three brickworks in town and were all built within the small area known as Newland, taking advantage of the abundance of clay from the area. A fourth works was founded in the 1890s by a man named Thomas Kirk from Nottingham who had heard rumours that Normanton was rapidly turning into an important junction on the railways. Both Kirk and his sons used their life savings and formed the Normanton Brick Company at nearby Altofts which is still in operation today. The coming of the railways enabled the locally-mined coal to be sent across the country. Demand soon outstripped supply and many more shafts were sunk to reach the rich coal seams under the town. In 1871 Dom Pedro, the Emperor of Brazil visited Normanton with his Empress and gave his name (albeit in a slightly altered form) to the Don Pedro colliery at Hopetown. Today roads in the area of the former colliery retain the name. At their peak the Collieries employed over 10,000 men most of whom wanted to move themselves and their families to Normanton. The town enjoyed a boom period with more mines opening and more shafts being sunk in order to meet the increasing demand for coal until most coal seams in the Normanton area were worked-out by the mid 1970s. The disputes surrounding the UK Miners' Strike (1984-1985) meant that many mines across the country were to close although by this stage there were no collieries still in production in Normanton. However, the strike still affected many families in the area, as Normanton colliers still worked in pits in neighbouring towns. The area once occupied by the St Johns or Newland colliery is now part of the controversial Welbeck landfill site which has been the subject of both local and national media attention since its development as a toxic tip. The site attracted so much negative attention that the group Residents Against Toxic Scheme (RATS) was established to halt planning permission for the disposal of toxic chemicals at the site claiming the scheme was an extreme health hazard. Normanton suffered some decline in the years following the miners' strike. The railway station was in such a state of neglect and disrepair that the decision was made to demolish it completely in 1986 and the section of railway line between Goosehill Junction and Crofton Interchange were lifted the year after. Very little now remains of Normanton's once proud railway and mining heritage with the only telltale signs lying covered in the undergrowth, hidden from view. Normanton has become a growing and popular commuter suburb of the emerging 'Greater Leeds' area, and is now favoured for its relatively cheap housing and excellent transport links. The town is still accessible via Normanton railway station and is currently served by an unmanned island platform station with regular trains to Leeds, Castleford, Wakefield and Sheffield Meadowhall Interchange. The addition and expansion of the Eurolink Industrial Estate at Junction 31 of the M62 helped reinforce Normanton as an ideal place for many national and multi-national corporations to locate their distribution depots due to its envious location. Being centrally located within the UK the town is served by three major motorway networks, the M62 linking Manchester to Hull (west to east), the M1 linking Leeds to London (North to South), and the North of England via a new link between the M62 and the A1(M) at nearby Ferrybridge. All Saints, is the Church of England Parish Church of Normanton, West Yorkshire. It is believed to have existed since at least 1256 and is built in the perpendicular style. The Newland estate was a small township on the outskirts of Normanton and lies on the north bank of the River Calder. Existing since 1213 when it was established by King John of England as a preceptory of the Knight's Templars, it was later transferred to the similar organisation, "The Knights Hospitallers" in 1256. The property belonging to the Hospitallers was dissolved by King Henry VIII who bestowed the property upon himself. The earliest known preceptor of the Knights Hospitallers was Simon Paccable in 1313. Newland was once held by the Levett family, and William Levett, who was lord of the manor, was admitted tenant of the Knights Hospitallers on October 2, 1447. The estate changed hands of ownership a number of times since King Henry VIII sold the land in 1544, with final ownership landing on The Warmfield Company Limited in 1926, who ran brickworks until the mid-20th century. Newland today is kept as a nature reserve, with the crumbling remains of the Estate overgrown with shrubs and plant life. A small fishing area just outside the Newland Estate remains popular with local fishermen. The old Normanton brickyard situated just off of the A655 Wakefield Road was used in the late-1990s as the fictional setting of a murder in the ITV series A Touch Of Frost. The structure was still intact albeit abandoned at the time of filming and was the ideal location favoured by the ITV production team. In the series a body was found by the Police in one of the factory's old kilns. Within 18 months of filming the structure had been declared unsafe and was partially demolished leaving only the chimney stack standing. Dictionary of National Biography, 1885–1900​. London: Smith, Elder & Co. This page uses content from the English language Wikipedia. The original content was at Normanton, West Yorkshire. The list of authors can be seen in the page history. As with this Familypedia wiki, the content of Wikipedia is available under the Creative Commons License.